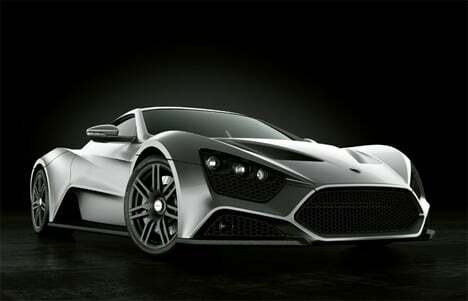 The Zenvo ST1 is designed to express the excessive power and performance of the car. The design brief from the Zenvo creators to the designers at hermann & brandt design consultancy was to design a supercar that looked like no other supercar. The design had to be aggressive mixing supercar styling with race car elements. The design of the car is made from free flowing accelerating lines creating the shape of the wheel arches, the roof line, side line and the lower side air intake. The sharp lines are connected by muscular organic surfacing creating dramatic reflections. Contrasting the general surfacing the design features a race car inspired lower carbon splitter. The front is designed around the hexagonal trademark Zenvo grille flanked by the large front air intakes used for brakes and engine cooling. The intakes are raked back to minimize drag and at the same time making the side impression of the car more compact. The theme of the front is repeated in the rear which is designed around the big diffuser necessary for high speed stability. As on the front the center volume is flanked by large air exits extracting hot engine air as well as housing the exhaust and rear lights. The rear spoiler mandatory for a car capable of extreme high speeds is partly integrated in the rear wing. It has a unique aerodynamic design following the raked shape of the rear end.